Seasonal snowfall in the mountains of Southern California is inconsistent at best. According to Tony Crocker’s Your Guide to Snowfall, in the past 20 years SoCal snowfall has ranged from a record high of 267 inches during the strong El Nino of 1997-98, to a low of 29 inches in 2013-14 during our prolonged drought. Snow-covered slopes from the PCT near Little Jimmy Spring. So far this season, Your Guide to Snowfall’s total for SoCal is 143 inches, which is a bit above average and far more than we’ve had in recent years. After seeing the amount of snow on the higher peaks of the San Gabriels from Mt. Waterman a couple weeks ago, I was curious to see what the conditions were on the PCT between Islip Saddle (6650′) and Mt. Baden-Powell (9399′). Joining me on today’s adventure was Patty Duffy. An avid outdoorsperson and ultrarunner, Patty did the JMT last year, and will soon be embarking on an epic border-to-border journey on the Pacific Crest Trail. Epitomizing the “hope is not a strategy” approach to challenges, today she was using much of the gear she would be using on the PCT — and in addition — carrying a sleeping bag, tent, stove and two days food! Icy stretch of snow on the PCT at 7100′, about 0.7 mile from Islip Saddle. Even though we started an hour later than normal, and temperatures had warmed the past couple of days, the snow on the shaded, north-facing slopes was still icy. Two hikers on their way down from Little Jimmy had trouble crossing one slippery slope. They had no crampons or micro-spikes and threw dirt on the snow to get by. It was obvious when we reached the area they described – a northeast facing gully. The slope was steep enough that a fall would have been very serious. 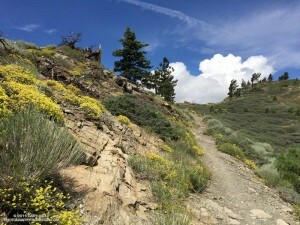 Steep slopes, chutes and gullies are common along the trail between Islip Saddle and Baden-Powell. Pine Mountain, Dawson Peak and Mt. Baldy from near Mt. Hawkins. 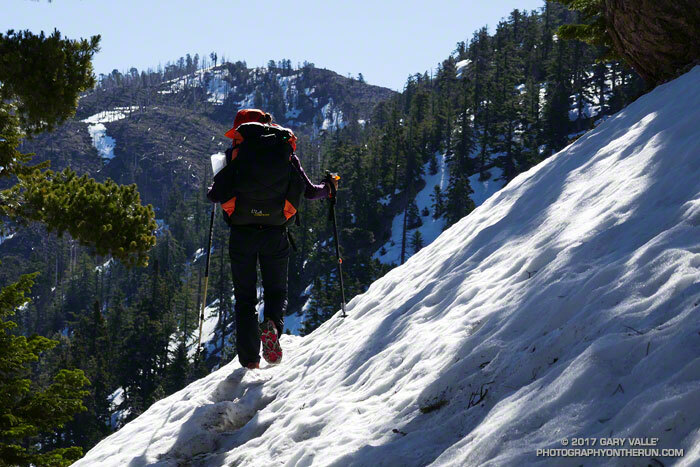 The question of what is appropriate gear for hiking an icy trail in this kind of terrain doesn’t have a simple answer. Boots, “real” crampons, and an ice axe provide a lot of security when crossing a steep, icy slope; but many other combinations of footwear, traction devices, poles, and self-arrest tools are commonly used. Conditions can rapidly improve or deteriorate and equipment can fail. Whatever combination of equipment is selected it’s important to understand its use and limitations. After reaching an elevation of about 8000′, we stayed on the crest all the way to Mt. Hawkins (8850′) and the Mt. Hawkins lightning tree. The ridge route had the advantage of being mostly snow-free, but in places is quite rocky and steep. There are also a number of downed trees scattered across the ridge — vestiges of the 2002 Curve Fire. Patty on the summit of Mt. Hawkins (8850′). 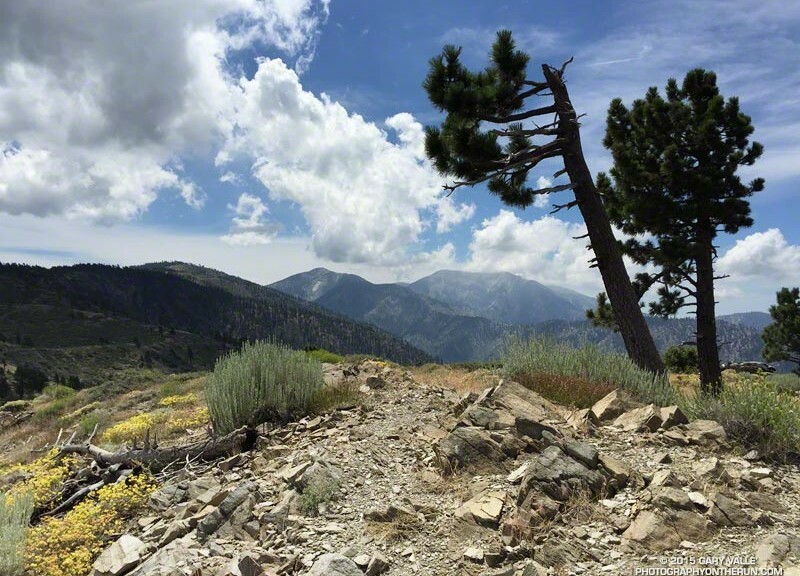 In middle of Winter in 2014 there was so little snow on the PCT between Islip Saddle and Mt. Baden-Powell it was possible to run to Baden-Powell and back, do Mt. Hawkins, Throop Peak and Mt. Burnham along the way, and be back to Islip Saddle in the early afternoon. Not today. Winter’s storms had left more of the trail snow-covered than snow-free — and not with just a little snow. A little beyond the Hawkins – Throop Peak saddle we stopped at a sunny, wind-protected spot with a nice view of Mt. Baldy for a few minutes, and then headed down. The snow conditions had improved considerably, and at one point we glissaded down a short slope. 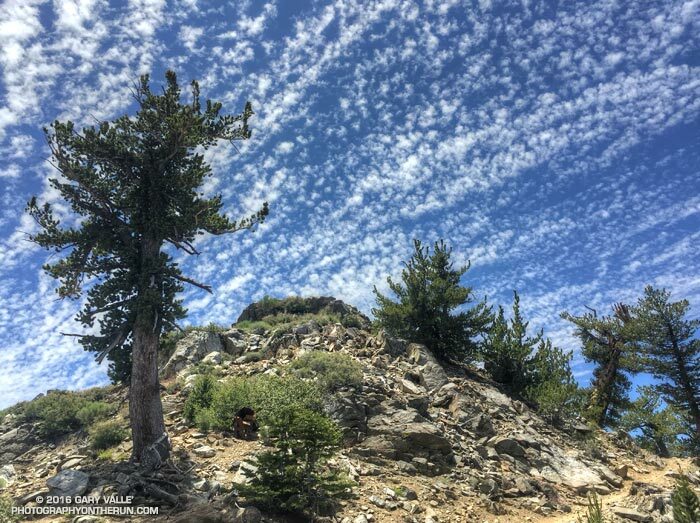 It had been another outstanding day in the mountains, and I could only sigh, thinking of the many great days and experiences that Patty would have on the Pacific Crest Trail. 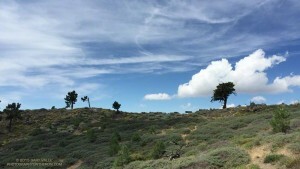 Crest and clouds on the Pacific Crest Trail at 8900′ near Mt. Burnham in the San Gabriel Mountains. 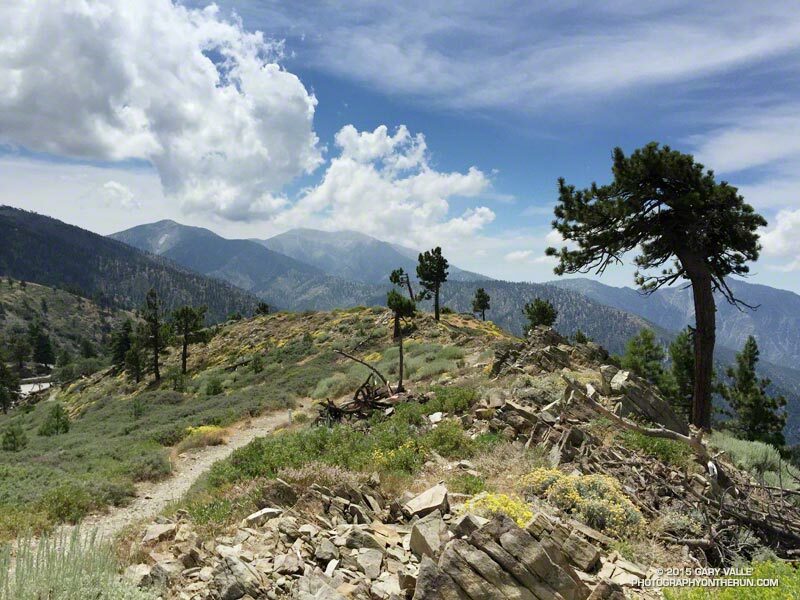 From Saturday’s 30 mile training run on the PCT and AC100 course. Temps were a bit more manageable on Saturday than Sunday. 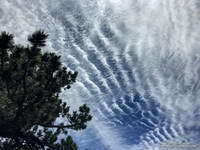 Saturday the Big Pines RAWS (6964′) recorded a high of 79°F with an “in the sun” temperature of around 101°F. 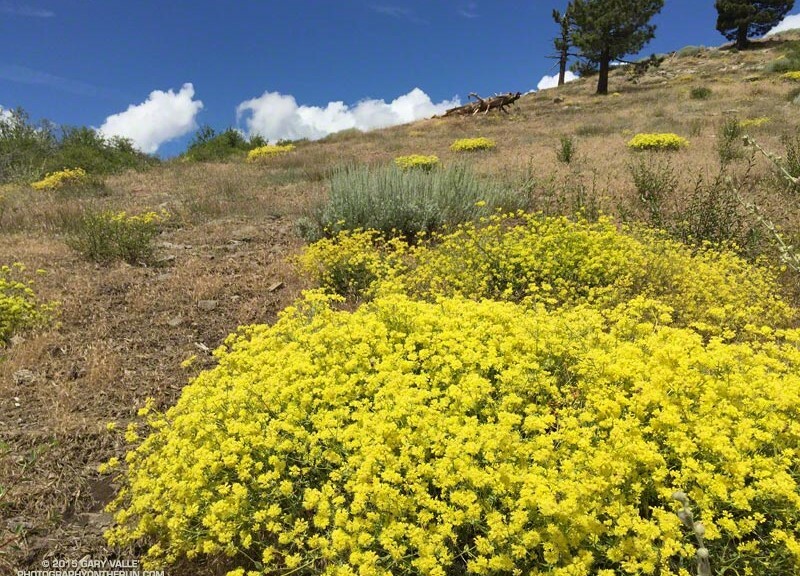 Sunday the Big Pines high was 89°F with a sizzling “in the sun” temperature of about 109°F. In addition to the air temperature many Remote Automated Weather Stations (RAWS) report the fuel temperature. The air temperature is the temperature inside a ventilated, sun-shielded enclosure approximately 6 ft. off the ground. The fuel temperature is the temperature of a pine dowel in full sun near the ground. The fuel temperature is a good indicator of the much higher temperature runners and hikers can experience in exposed areas facing the sun. 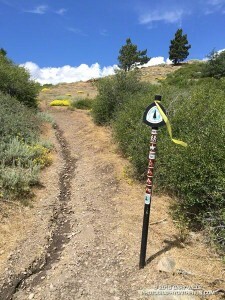 Some related posts: Postcard Weather on the Pacific Crest Trail, What’s the Current Weather on the AC100 Course? Although we are still experiencing a record-breaking drought, this rain season did provide a little short term relief to plants and wildlife. Compared to last year rainfall is up 27% at Los Angeles, 39% at Santa Barbara, 57% at LAX and 63% at Camarillo/Oxnard according to NWS data. 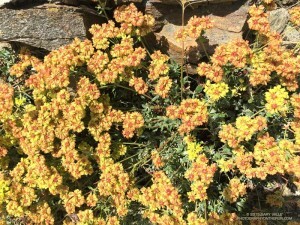 The increase in rainy season precipitation dramatically increased plant growth, the abundance of wildflowers, and temporarily increased the availability of key resources to wildlife. Another thing it seems to have increased is the number of rattlesnakes. 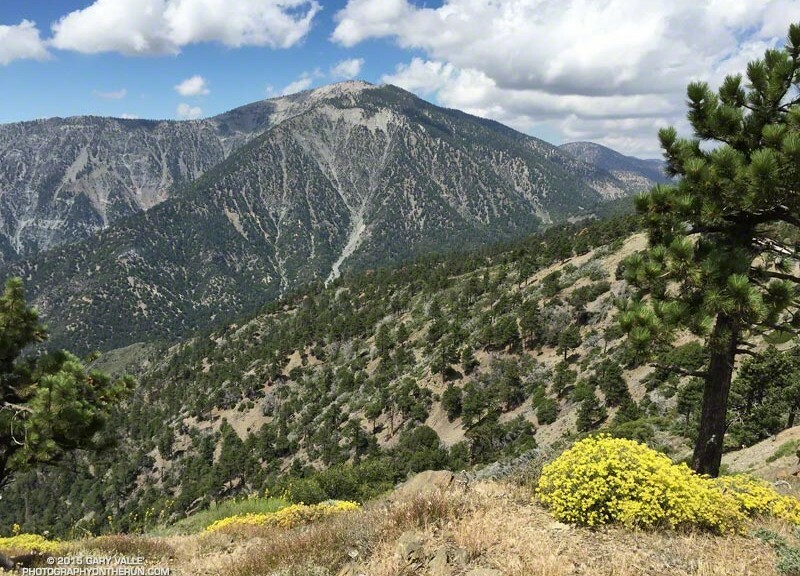 Over the past two years I have seen maybe two rattlesnakes total on my runs in the Santa Monica Mountains, San Gabriel Mountains, and in the Big Bear area and on San Gorgonio Mountain. In the Ahmanson Ranch – Cheeseboro area I’ve seen none. With the increase in rainfall this season that has changed. The title photo was taken on the Leona Divide 50/50 course March 28. That day I encountered two rattlesnakes and talked to a runner that had seen three on the course the previous weekend. From March 26 to April 2 I encountered rattlesnakes on three out of four runs. 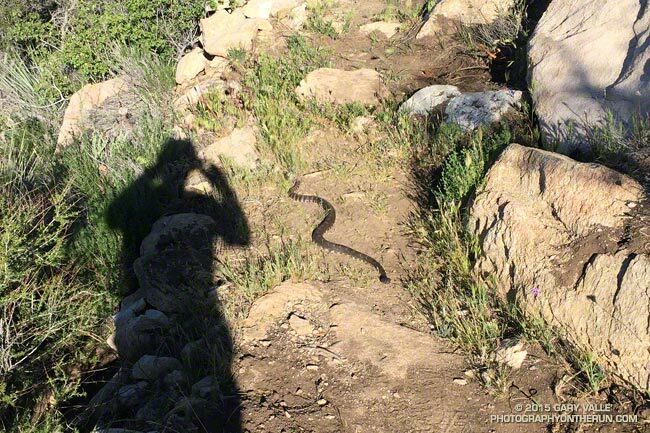 Two of those were at Ahmanson and it seemed everyone I talked to on the trail was seeing rattlesnakes. See the rattlesnake? Click for larger view. There has also been an increase in the number of encounters with non-venomous snakes as well. I’ve seen a number of gopher snakes and a California striped racer. Friends have mentioned seeing a ring-necked snake and California kingsnake. 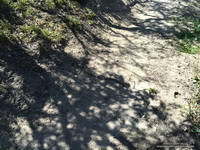 Since the weather has cooled I haven’t encountered any rattlesnakes, but have seen their tracks. When I run, especially on single-track trails, my snake radar is on and I’m definitely on the lookout for the hard-to-see beasts.